When you first start doing yoga, it's hard to know what you really need to buy. The yoga industrial complex continues to develop so much clothing and equipment that you might feel you need to spend hundreds of dollars before ever stepping foot in a studio. The good news is, you actually need very little to get started. That said, if you're starting a home practice, or you'd feel better about purchasing yoga-specific apparel and equipment prior to your first class, here's what you need to know. It should go without saying that most yoga studios want you to wear something to class, but you don't need scores of printed yoga pants or designer gear to be accepted by your peers. Start with the comfortable, breathable athletic apparel you already have on hand, and purchase mid-level basics for anything you're missing. Pants or Shorts: You can't go wrong with a few pairs of solid-color yoga pants in black, dark grey, navy, or brown. You can mix-and-match these tights with a wide variety of tops, and if you purchase high-quality options, they can last a long time. If tight pants aren't your thing, look for jogger-style pants or the popular harem-style pants that have elastic around the ankles. These pants are stretchy and offer a little extra room, but due to the ankle elastic, they'll stay in place throughout your practice. Shorts are a popular option for guys, and they're also appropriate for women, especially if you plan to try hot yoga. Just keep in mind, you may want to wear form-fitting spandex shorts or looser shorts with connected tights underneath because some poses require you to position your legs in a way that could leave you uncomfortably uncovered with looser, running-style shorts. Tops: It's important to wear tops that are fairly form-fitting so your shirt doesn't fly over your head during forward bends. Wicking material is helpful, especially if you tend to sweat a lot or if you plan on attending a hot yoga class. Because yoga rooms are often kept cool, you may want to bring a light cover up or sweater with you to class. You can wear it until class starts, and if you keep it by your mat, you can put it on before the final savasana. Sports Bras: If you're a woman, make sure you wear a sports bra. While yoga tends to be a low-impact activity, a decent sports bra can help keep your "girls" in place as you transition between poses, making your practice more comfortable. Hair Ties or Headbands: Whether you're a man or woman, if you have long hair, you need to secure it in place before you start class to prevent stray locks from falling in your eyes and face. A basic hair tie or headband should do the trick. Yoga Socks: To be clear, yoga socks are not a requirement to attend a class. In fact, it's preferable to do yoga barefoot. That said if you can't fathom the thought of taking your socks and shoes off in front of strangers, invest in a pair of yoga socks with grips on the bottom so you can keep your feet covered while maintaining good traction. Standard socks absolutely won't do, as you'll end up slipping and sliding all over your mat. These days, you can buy yoga apparel practically anywhere, and it's not unusual to see yoga pants priced at over $100. Don't feel you need to lay out that much cash for a single pair of pants! Target, Amazon, and YogaOutlet offer quality options for well under $50. Buy a couple pairs of pants and a few tops, and you'll be set for months. As you commit yourself to your practice, you may decide to add trendy prints or styles to your wardrobe. 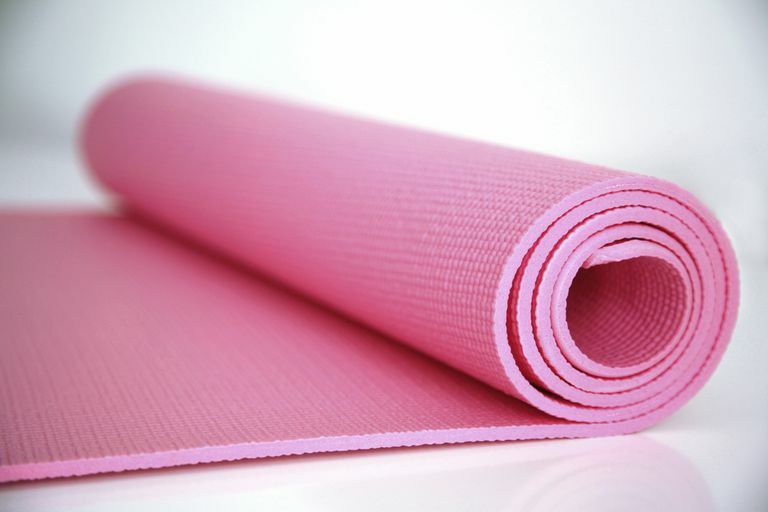 In gyms and yoga studios, it’s commonplace to use a yoga mat, also called a sticky mat. The mat helps define your personal space, and, more importantly, it creates traction for your hands and feet so you don’t slip, especially as you get a little sweaty. The mat also provides a bit of cushioning on a hard floor. Most gyms provide mats and studios have them for rent, usually for a dollar or two per class. This is fine for your first few classes, but the disadvantage to these mats is that lots of people use them and you can't be sure how often they're being cleaned, so you may consider buying your own. Premium yoga mats can be expensive, often around $80 to $120, but it's possible to find a starter mat for as little as $20 from retailers like Target and Amazon. Just keep in mind, if you decide to buy a cheaper mat, you'll probably find yourself replacing it in short order if you use it often. If you're really ready to commit to a yoga practice, your mat is one place it's worth it to lay out some cash. Decide which mat features are important to you—for instance, length, thickness, material, durability, comfort, traction, or how to keep it clean—then buy a mat with good reviews based on your needs. Manduka and Lululemon are known for the quality of their Pro Mat and The Reversible Mat, respectively, but other brands, including Jade and Yellow Willow, also offer high-quality, durable mats with good traction and support. Yoga props are a boon to a fledgling yoga practice. Props allow students to maintain the healthiest alignment in a range of poses as the body bends, twists, and opens up. They also help you get the most out of each pose while avoiding injury. You should familiarize yourself with the props described below, but you don't need to buy your own (unless you're starting a home practice) because they are almost always provided by studios and gyms. If you own your own yoga mat, and you're going to be lugging it back and forth to the studio on a regular basis, there's a legitimate case to be made for purchasing a mat bag or sling. These accessories do exactly what they suggest—they make it easy for you to sling your rolled mat over your shoulder without it coming unrolled. Slings usually use velcro straps to bind your mat in its rolled configuration with a connecting strap you can throw over your shoulder. Slings sometimes offer additional pockets for storage, but not always. Bags, on the other hand, typically come in one of two styles. One version uses velcro straps to keep your rolled mat secure against a larger gym bag. The other version is essentially a snap- or zipper-closure bag specifically designed to hold your rolled mat. Both styles provide extra storage for clothing, wallets, cell phones, and the like. The style and brand you choose really comes down to personal preference and budget, as slings can cost as little as $10, and heavy-duty bags can cost well over $100. For variety, check out YogaOutlet, where you can find an array of brands at reasonable prices. Yoga studios usually have stacks of blankets available for students to use during class. Grab one or two blankets at the beginning of class. Folded blankets can be used to lift the hips during seated poses, or to offer support during lying poses. For instance, when you sit cross-legged, you can place a blanket under your sit bones to elevate the hips above your knees. Blankets come in handy for all sorts of things during class, and if it’s chilly, you can use them to cover up during the final relaxation. For a home practice, there's truly no reason to purchase new blankets. Simply use what you already have on hand around the house. If, however, you don't own any extra blankets, YogaOutlet offers them for as little as $13. Like blankets, yoga blocks are used to make you more comfortable and improve your alignment. Blocks are particularly useful for standing poses in which your hands are supposed to be on the floor. Placing a block under your hand has the effect of "raising the floor" to meet your hand rather than forcing the hand to come to the floor while effectively compromising some other part of the pose. This can be seen in half moon pose. Many people don't have the hamstring flexibility or core strength to hold the position with proper form. By placing a block under the hand that's reaching toward the floor, it's easier to keep the chest open and torso strong. Without the block, the chest might be inclined to turn toward the floor, the supporting knee might be inclined to bend, and the torso might be inclined to "collapse." The simple use of the block helps maintain proper alignment. Yoga blocks are made of foam, wood, or cork. They can be turned to stand at three different heights, making them very adaptable. If you plan to do a lot of yoga at home it's worth it to get a set of blocks (helpful for poses where both hands are reaching toward the ground). If you're going to attend classes, blocks will be provided for you. The good news is, almost any block is sufficient, so this is an area you don't have to worry too much about skrimping on. But slightly wider blocks—those that are at least four-inches wide—provide better stability. YogaOutlet and Amazon offer several sizes and styles for under $10 each. If you're willing to pay a little more, Yoga Hustle offers some fun options for $24 a pop. Yoga straps, also called belts, are particularly useful for poses where you need to hold onto your feet but cannot reach them. The strap basically acts as an arm extender. For instance, in pascimottanasana, if you can't reach your feet with your hands in the seated forward fold, you can wrap the strap around the bottom of your feet and hold onto the strap to maintain a flat back instead of slumping forward. Straps are also great for poses where you bind your hands behind the back (marichyasana, for example). If your shoulders don't allow enough flexibility for the bind, you can use a strap to "connect" both hands without excess strain. And with the strap's help, you can move your hands toward each other over time to make progress toward the full bind. You probably have something around your house that would work as a strap (like a belt or even a towel) and yoga studios supply them for use during class. That said, if you really want to buy an official version, it's hard to beat the price of YogaOutlet, where you can find straps for under $10. Bolsters have many uses for yoga students. You can use them in place of a stack of blankets to make seated and forward bending poses more comfortable. You can place them under your knees or your back when reclining for support and passive stretching. They are particularly handy in restorative and prenatal yoga classes. If you take this type of class, the bolsters will be provided. If you want to do restorative yoga at home, it may be worth it to invest in your own bolster. The are two basic bolster shapes: round and flat (more of a rectangular shape). Flat bolsters tend to be more ergonomic; however, round bolsters can be useful when you want more support or a deeper stretch. It comes down to personal preference. If you have the option, use both styles in class before you decide which one best suits your home practice. Amazon is the best place to shop for sheer variety and price, but if you want a pretty bolster, check out Hugger Mugger, Inner Space, or Chattra. The prices are in line with the marketplace ($40 to $80), and the designs are bright and beautiful. Yoga wheels are a relatively new prop starting to gain a foothold in the yoga studio. These wheels are roughly 12-inches in diameter and are about four-inches wide. When set upright, you can lie back on the wheel or place a foot or hand on top of the wheel to deepen your stretches and enhance flexibility, slowly rolling the wheel farther as you relax into each stretch. Wheels can also be used in more advanced practices as a way to challenge stability or to offer support during challenging poses. While it's unlikely that you'll need a yoga wheel as a beginner, you may want to consider a purchase down the line. Most wheels range in price from $40 to $60. Yoga Design Lab, for instance, offers one for $48.